The team behind the redevelopment of St. Matthew's Evangelical Lutheran Church came before the ANC earlier this month to give an update on their plans for the site, located at the southwest corner of M Street and Delaware Avenue. 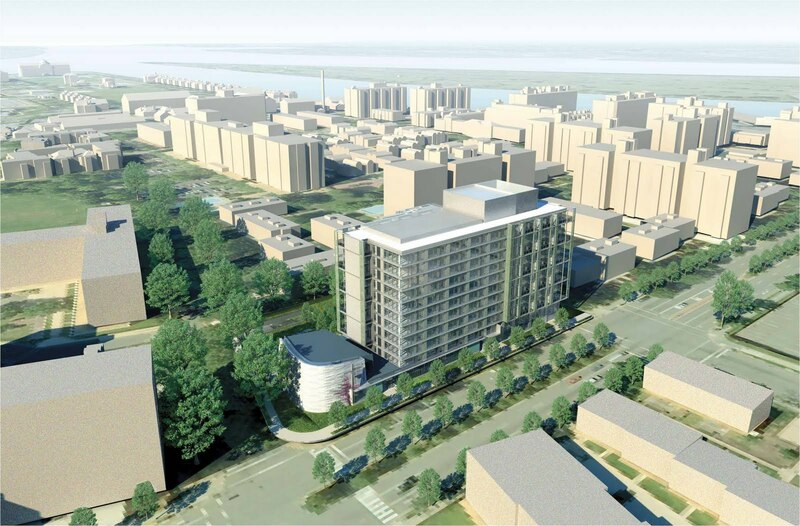 Local architectural firm Shalom Baranes Associates designed the buildings and the project will be built by Trammell Crow and CSG Urban Partners. 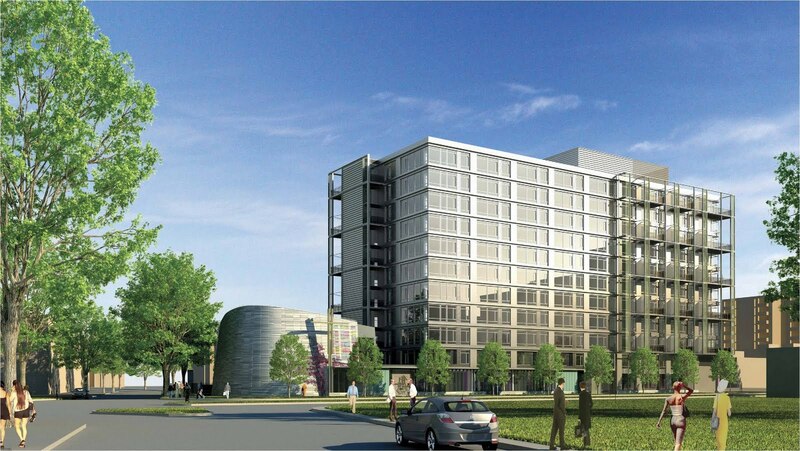 The development team submitted a Planned Unit Development (PUD) for the project in early June and construction is scheduled to get underway in 2012 with completion set for 2014. The apartment building is shaped like the letter L, with an 11-story building fronting M Street and an 8-story building on the west side perpendicular to M Street. Approximately 220 residences are planned, with 10% set aside under inclusionary zoning as affordable housing. The apartments are not affiliated with St. Matthew's, so anyone can apply to rent a unit. 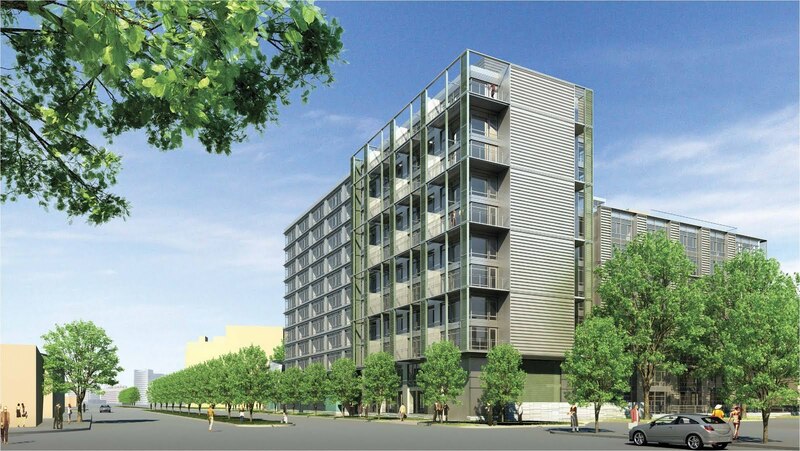 There will be metal cladding on the apartment building along with two-story metal panels as seen in the above rendering. Design cues for the building were taken from neighboring residences like River Park and Waterfront Tower, and the incorporation of a courtyard was done to fit in with the Southwest building style of having apartments frame courtyards. Approximately six private patios will be on the ground level for tenants. 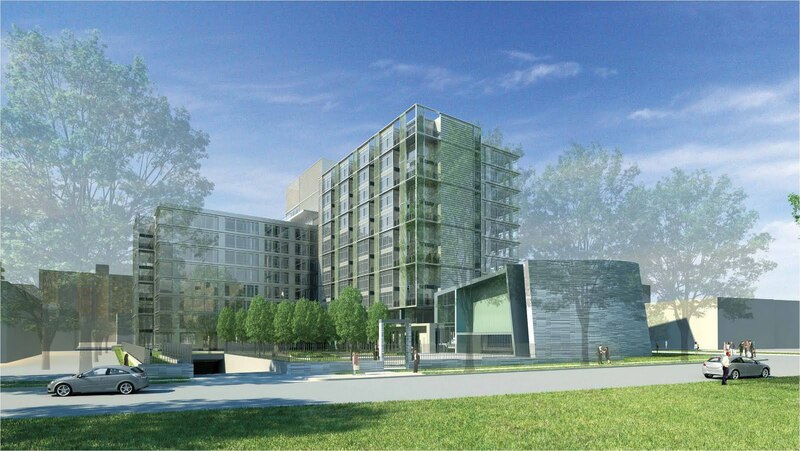 Other apartment amenities include a fitness center, lounge, screening room, and about 133 parking spaces. Local landscape architectural firm Oculus has designed the courtyard - the same firm that designed the Waterfront Station Metro plaza.T﻿﻿he courtyard area will be shared between the church and apartment building with a seating area and a shallow pool that will be connected to the fellowship hall of the church. There will be a bosque of trees in the center of the courtyard and a paved area in front, facing Delaware Avenue. A landscaped buffer will be installed along Delaware Avenue to shield the outdoor space and provide some security. Existing trees will be maintained on three sides - Delaware Avenue, the western border with 240 M Street, and on the south. New landscaping will be planted on M Street. Parking will be accessed via Delaware Avenue and loading will be done on M Street. All main pedestrian entrances (for the church, community center, and apartment building) will be on M Street. As a missional congregation, it reminds St. Matthew’s that they are sent by God to our community; it reminds St. Matthew’s and the community that the church is alive, growing, and branching out; and it reminds us that growth and life comes from being "attached" to the cross of Christ. The vine will also act as a dynamic "church sign" - changing the view of the church as the seasons change. Sacred Grounds Cafe: "Coffee with a Purpose"
A set-down hearing won't happen at least until October, so the ANC will have a chance to vote on the PUD application sometime this summer. Any word on whether residents need be members of St. Matthew's Evangelical Lutheran Church? ^hey, now that's an innovative way to get new members! For some reason I think that might be against at least one law. Cool building design! I'm glad the architects at SBA decided to incorporate the "modern-glass brutalist" design (made that term up) that seems to be the new de-facto style taking over M Street. Great to see more infill development of under-utilized land near Metro stations, and more buildings that front onto M Street. Perhaps this can show the way for more infill around the neighborhood -- more residents can only mean more shops, restaurants, and services. May thanks to Will for making this post and sharing our plans with the community. I am very excited about the design--particularly the courtyard. It promises to be very nice urban space where we can all share a cup of fair trade coffee. St. Matthews is a co-owner in the project and, of course, implicit in our mission and ministry-- all that we do is for everyone in Southwest and DC. The apartments, Sacred Grounds Cafe, resource center, fellowship hall, courtyard, and meeting space are being built to benefit ALL of our Southwest community. There were some who used to say that the old St. Matthew's building was a "Towne Center" for Southwest. If in any way that was true, I hope the new building can expand and be even more vital in our life together in Southwest. I, more than anyone, will be happy to see the bowed fence on St. Mark's property go away. While the building and community design is impressive, the scale of it doesn't seem appropriate for the neighborhood. Sadly, it looks as though it will tower over the older buildings of SW, thus blocking many of the neighborhood's Capitol views. I am curious whether St. Matthew's has considered this. Personally, the height of this design seems self-serving and reflects poorly on St. Matthew's; I don't see them as being a conscientiousness member of the community.